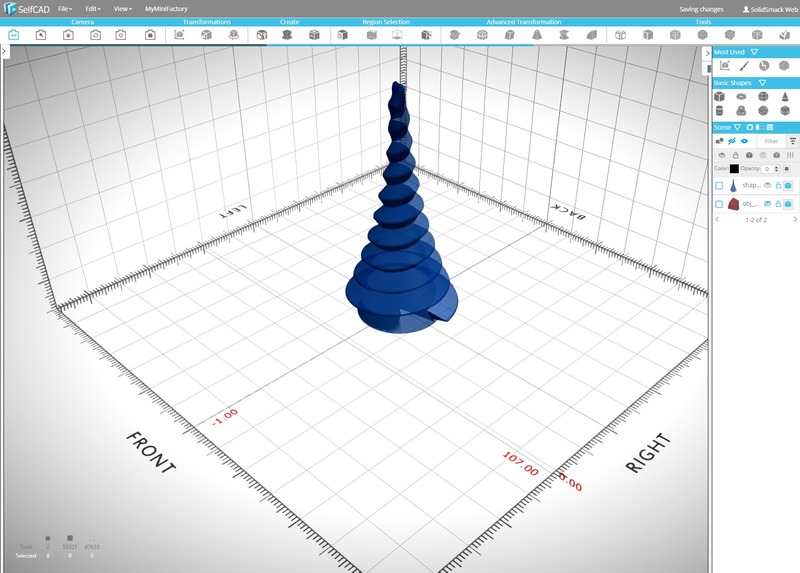 There’s a new online 3D CAD player in town and they’ve been gaining steam over the past year since announcing beta and opening up registration. SelfCAD describe themselves as an online browser-based 3D model, sculpt, print platform with a mission to “make 3D designing and printing accessible to everyone, including professional designers, as well as hobbyists and students who have little to no prior expertise using CAD/CAM software.” Along with this it has integrated slicing to 3D print directly from SelfCAD and in June they announced an integration partnership with MyMiniFactory that connects you dirrectly to the model repository from within SelfCAD. To overcome the limitation of other solid modeling applications they have developed their own unique topology structure that allows complex transformations in a user-friendly way. And while they have their own structure, they revealed to us there is the flexibility to add T-spline/NURBS modifiers as plugins. While they are, in fact, trying to target people that do not necessarily have a lot of CAD modeling knowledge or experience, professional designers may be comfortable with SelfCAD, with those interviewed praising SelfCAD for it’s ease of use, accessibility on the go, and for its 3D print capabilities. The SelfCAD Editor is minimal, but with lots of slider modifiers, Camera and Workspace options, Model Transformation and Creation options, an array of Select, Sculpt and 3D printer output options. After a tool is selected, the options are displayed in a secondary toolbar or sidebar with additional toll selection and scene information in another sidebar which can be docked to the right or left. For those use to the typical sketch/extrude feature tree CAD workflow, SelfCAD’s approach is slightly different. While you can sketch lines, every Create feature, whether it’s a drawing, shape, spline or surface generates geometry. The best I can describe SelfCAD is that it’s like sculpting in CAD modeling software, even while drawing or erasing lines. In other words, it focuses more on generating geometry than parametric sketches. Once you understand how to create geometry though, the whole process is quite intuitive. That said, some additional features would be great. ‘Standard’ 3D modeling features like unit settings, grid snap, mirror, pattern are missing. Transform previews, more import/export options, and direct geometry editing (perhaps through a double-click or context menu) with a way to go back and change settings applied to geometry would be great to have. Dimensioning, mates/relations and parametric modeling would be a nice addition as well–Ya know, those things we who have spent years in 3D CAD software just can’t tear ourselves away from. Overall, SelfCAD is an incredible combination of modeling, sculpting and 3D printing a novice can start using immediately, but with enough features for a 3D professional to appreciate. Oh, and those with a Wacom tablet are going to LOVE the sculpting. In fact, it’s really the best options for sculpting–you’ll realize this quickly after a few minutes of wiggling that mouse around. Currently, SelfCAD is supported on Windows 7, 8 and 10, Mac and Linux with browser support for Chrome, Firefox and Safari. Tablet support is in the works and focused on keeping the functionality while being fast and accessible. SelfCAD has a super simple, super attractive pricing option. $9.99/month gets you unlimited use of all the platform offers. It is also free for students and teachers. You can register for a 30-day free trial and find a lot of SelfCAD tutorials that go over the user interface, getting started and designing your first object. 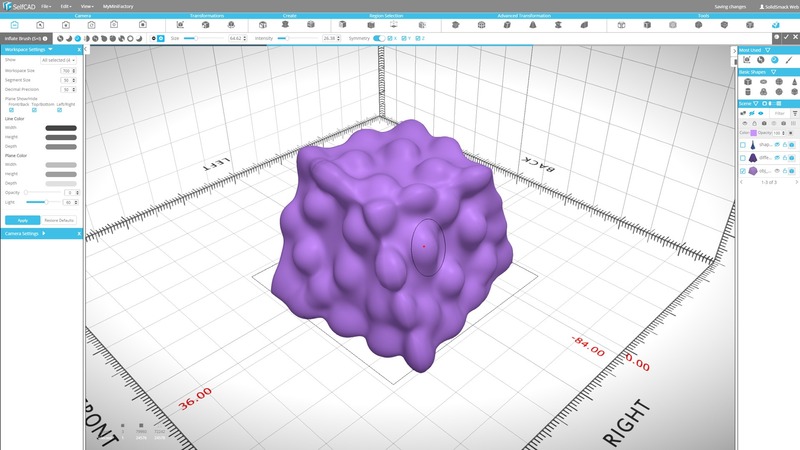 There are a few Future-of-CAD things we’ve wondered about over the years here on SolidSmack. Those thoughts have ranged from ideas around shape recognition and adaptive interfaces to NURBS-Poly modeling and proliferation of browser-based CAD apps. Those are some pretty big hurdles to jump, and while we’ve seen a smattering of these ideas, seeing SelfCAD and the approach they’ve taken makes me think we may be at that point where we’ll see more independent development of browser-based 3D CAD related apps and more accessible methods for making ideas happen. To keep up to speed on what’s going on with SelfCAD you can visit their blog or follow them on Twitter and Facebook.